Have fun whipping up a batch with your little kitchen helper. This recipe for colorful Chanukah sugar cookies comes to us from foodie and mom Elizabeth Sternberg. Have fun whipping up a batch with your little kitchen helper! In large bowl, cream together butter and sugar until smooth. Beat in eggs and vanilla. Stir in flour, baking powder and salt. Cover and chill dough for at least one hour (or overnight). Preheat oven to 400 degrees. Roll out dough on floured surface to 1/4-1/2 inch thick. Cut into shapes with your favorite cookie cutters. Place cookies one inch apart on ungreased cookie sheets. 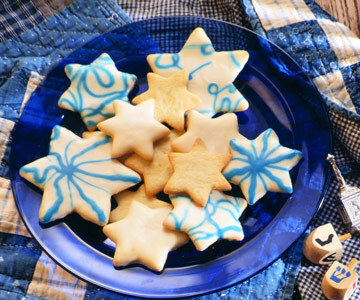 Paint cookies using icing recipe below and your imagination—draw stars, Judah the Maccabee, dreidels, Lion of Judah, Israeli flag, Hanukiah, candles, latkes…you name it! Bake six to eight minutes; cool completely. Recipe makes five dozen. Mix egg yolk and water. Divide mixture among several small cups. Tint each cup with food coloring to make several bright colors. Paint designs on unbaked sugar cookies with small paint brushes and bake cookies as directed. If icing thickens while standing, stir in several drops of water. To keep your kids occupied while the cookies bake, try the “Hanukkah Coloring & Activity Book” by local author Emily Sper. It’s available in local bookstores and online at emilysper.com/hactiv.html. 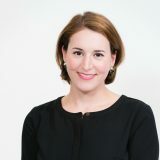 Kali Foxman is the director of JewishBoston.com.